Home Columns	Yes We Have No Bananas!! Oftentimes when you search for one thing, you find another. That?s the tacit part of the old ?seek and ye shall find? adage. As the Rolling Stones interpreted the verse, ?You can?t always get what you want, but if you try sometimes you just might find you get what you need.? For example, I set out recently to find Blackfish on the <Snow Goose 2>, and all I caught was a cold. What I found instead was six lovely hours (stuck) on a boat on a gorgeous day to catch up with a friend I?d dragged along. That was just what I needed, the best catch of the day ever. Fishing may not sound very inviting with winter on the way, but I?ve thought <I gotta get out there> every time I see the boat from the Costco parking lot, and I finally just did it, darn it, before the season ended. I fished online for some blackfish facts beforehand. 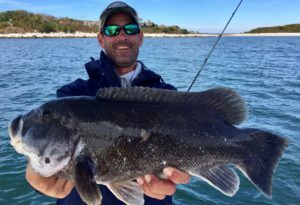 Blackfish or ?Tautog?, so named by the Native American Narragansett tribe, live in the western Atlantic Ocean from Nova Scotia to South Carolina. 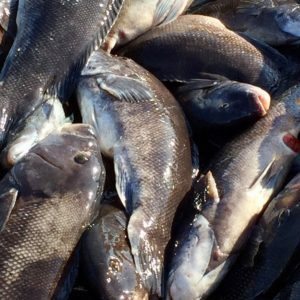 They are also called black porgy, chub, and oyster-fish. They run our waters in November and are really unattractive. They have thick rubbery lips and powerful jaws, which help crush and eat crustaceans and mollusks. They are covered in heavy slime, which helps protect their skin while they swim among rocks getting your line hung up. They must be 16? 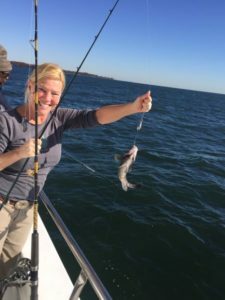 long to keep, and the limit by law these days is three per fisherman as they are vulnerable to overfishing. They?re good eating, make great chowder, and hold up well on the grill or in the saut? pan. An unexpected pleasure was the camaraderie that results when strangers are bound together in mutual purpose. The only thing we had in common was our desire to fish, and the least we could do was share it. Was reminded of the fishing scene in ?One Flew Over the Cuckoo?s Nest,? one of my all-time favorites. ?We? included a DJ who supplied the sound track for the day from his phone and a speaker, a former lead singer of a metal band who had enjoyed acclaim in the ?80s, several retired firemen and policemen from Mahopac, an Irish sailor, an overgrown tomboy from Louisiana, and various other diehard fishermen who had taken the day to play, about 30 in total. When top-heavy ships of earlier eras would sink, precious little other than the bananas they?d carried would be found floating on the surface, leaving some to conclude the fruit itself had led to these naval mishaps. Spiders, snakes, and other poisonous vermin living among bananas carried in the hold would infest other parts of the ship. The speediest sailing ships were used to get bananas to their destinations before they could spoil, so those attempting to fish from them never caught anything while trolling. Crew members injured by slipping on discarded banana peels. We had no bananas on board, and all in all it was a good day. A day fishing trumps a day running errands, even when you catch nothing but a cold. You never come home from an adventure empty handed. And you just might get what you need. <The Snow Goose 2>, alas, closed for the season on November 30, but put her on your list for next year. Captain Kevin departs 0800 daily from Bar Taco dock, returning 1500, May through November. Arrive early enough to get a parking pass on board and to claim your fishing spot. No reservations. 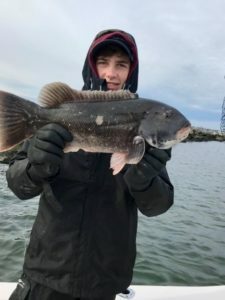 $55 cash includes gear and bait. Bring lunch, water, rags to wash the fish slime and bait gunk off your hands, a knife, and beer. Pick up hot-oil pizza at Colony Grill for dinner after.